Picking college bowls is becoming a popular pastime. We have numerous configuration options for our Pickem and Conficence pools. Create a College bowl pickem or confidence league or join an existing league. You pick every bowl game. For each win you get the points assigned to that game. The player with the most points after the bowl season wins! You pick every bowl game, placing a weight from 1 (lowest confidence) up to the number of bowl games. 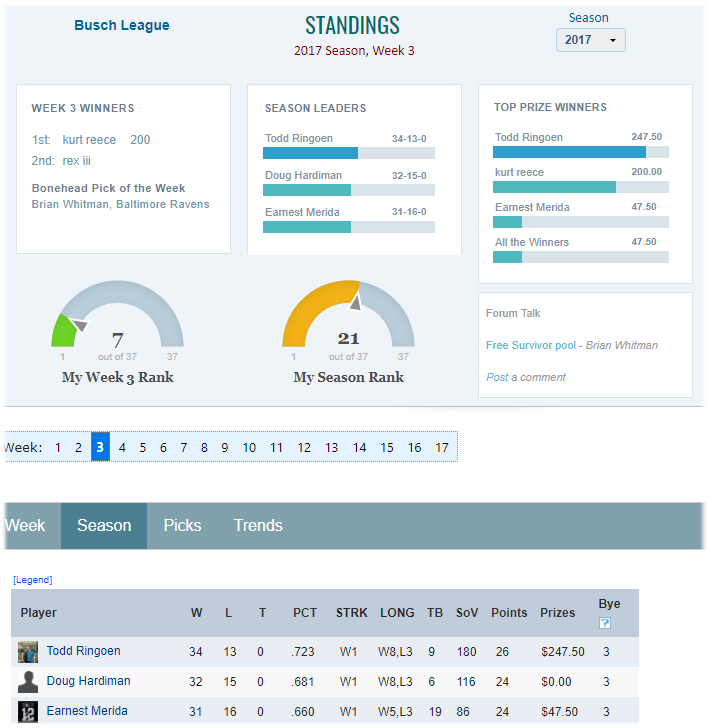 Standings page that includes win/loss pct, total points, trend graph, and player's picks. Comprehensive, life-long stats on your pick'em or confidence league and your individual performance. Setting the pool to be straight up or against the spread. If against the spread, the line can be set to variable (player gets the line at the time of his pick), or fixed (all players get the same line). Specifying your own point values for games (for example, you can set some games to be worth twice as much as other games). Specifying an exact number of bowl games to pick (default is all games). Selecting which bowl games your league picks (default is all games). Specifying final prizes for 1st through 4th place, best total tie-breakers, and best overall Strength of Victory. One custom prize, where you name the prize and set the winner when appropriate (for example, "highest pick em key games winner"). Tracking of player league fees and per-player note annotation (e.g. "this player gave me a check on Tuesday"), and optional notification to the player when they log in to the site if they have a balance due.